Steve Saka mentioned that the Muestra de Saka Nacatamale is one of his favorite cigars in the Dunbarton line up - no surprise for a cigar that bears his name. The Muestra de Saka line is intended to have about seven unique vitolas - although that news came prior to the upcoming Unicorn. The Nacatamle is the sophomore release, preceeded by the Exclusivo. From Halfwheel, Saka explains the concept behind the Muestra line: "Muestras are hoarded and coveted by not only their makers, but by the cigar smokers who seek to catch a glimpse into the cigarmaker’s soul within their smoke. Muestra de Saka is just that. A line of unique blends and vitolas made in extremely limited quantities that reflect the blending machinations of myself. To smoke a Muestra de Saka is to embark upon a journey with me in which I greatly welcome your companionship." The Nacatamale is an homage to old-school blending called "viejo granja" in which all the tobacco for a blend is grown at a single farm. The cigar derives its flavor profile and complexity not by using different leaves from various regions, but rather how the leaves are treated, processed and blended. While the exact farm that produces the Nacatamale is undisclosed, it is known that it's from Jalapa, Nicaragua. There is no intention for the Muestra cigars to relate to one another. The line is meant to serve a portfolio of Saka's line - each vitola using unique blends to showcase a particular concept. Appropriately Muestra de Saka translates to "Samples of Saka". The Muestra line is not necessarily limited but it's not exactly limited productoin either. Saka wants to produce them in a regular, controlled-release manner and not in a 'one-and-done' method - excellent news as I really hope the Exclusivo comes back into production since I've smoked through a couple boxes of the insanely fantastic stogie. To date, each of the Muestra de Saka cigars has been packaged in a coffin with a yellow, handmade silk ribbon adorning the foot. Saka says the use of a coffin is an arbitrary choice to stand out in humidor - it more or less helps the new line get some instant recognition on crowded humidor shelves. The presentation of the Muestra de Saka line is meticuously perfect. The dark box opens to reveal seven coffins that fit exactly into the box. The coffin itself uses a slide-top lid that labels the brand, "Muestra de Saka," along with a crossed fork and knife - a cool nod to the culimary inspiration behind the Nacatamale. 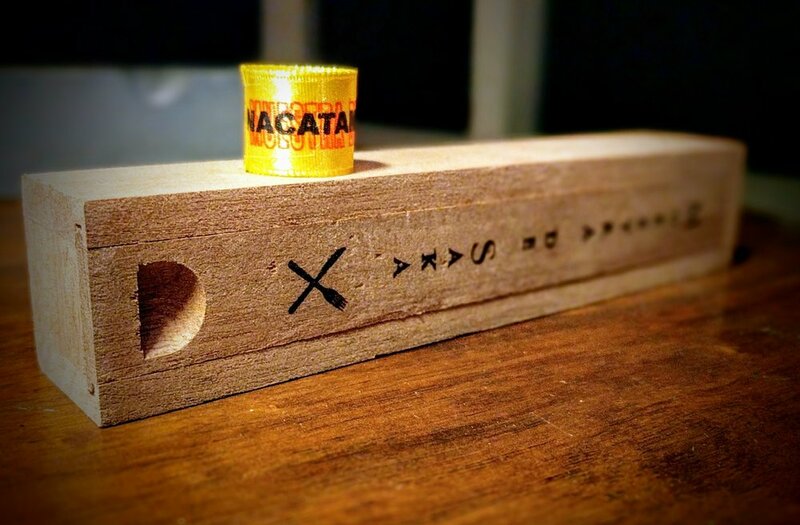 The side of the coffin identifies the cigar line, "Nacatamale," and the cigar's length and ring gauge. Once you slide the coffin open the yellow band on the foot is consistent across the whole Muestra line. There is red, hollow text calls out the Muestra line and bold, black text tags it as the Nacatamale. The presentation on these is fantastic and certainly everything you'd expect from a cigar of this caliber and cost. The Nacatamale is wrapped is an Ecuadorian Habano wrapper that is drop-dead gorgeous. There's a little toothiness on the oily, dark brown leathery wrapper. The seams are utterly perfect - sitting completely flat against the body and hidden from sight by the wrapper's uniform color. There are a decent amount of small veins and, not that it would bother me otherwise, they are relatively flush to the wrapper. This is a very firm cigar with almost no give to it. A light inspection does not turn up any soft or overly hard spots - all pointing to a very nicely crafted cigar. The triple cap sports a pig-tail / fan - a detail I always love. To me, it shows some thought really went into the cigar's design. The Nacatamale appears to be an excellently designed cigar where no detail went without careful consideration. Once the golden fabric foot band is removed, the foot is fairly unremarkable - in a good way. The foot showcases the blend as a tightly, consistently rolled stogie. The Nacatamale is a work of art. On the nose, there is a generous dose of leather, some light cedar and cocoa. Smells fantastic. I v-cut the fan-tail off to reveal a very densely rolled interior. The draw is fairly tight but not too bad. The flavors off the cold draw bring leather, sweet and aged tobacco and a hint of milk chocolate. The Nacatamle lights up easily enough and the draw is still a little snug but good enough to get things going. The first initial puffs bring an immediate black pepper spice to the palate. Once you get past the pepper, there is a hint of chocolate/cocoa, some leather and a bit of cream. The ash is speckled grey and white that is stacking really well. For how dense this cigar is I've got a feeling ash retention is not going to be an issue for the Nacatamale. The smoke production on the Nacatamale lives at extremes. After a couple quick puffs, the stogie is a chimney - churning out voluminous amounts of pure white smoke. However, if you let it sit for about 5 seconds, the smoke is basically non-existent. The smoke itself has a pleasant aroma to it. As the cigar progresses, the pepper wains and is slowly replaced by a bread and a light peppery creaminess that coats the palate with silky awesomeness. The cigar really starts with a huge blast of pepper and casually, yet expertly, swaps it out as it burns. The retrohale is quite tame but does bring back the pepper in a much stronger fashion and some nutty notes - maybe unsalted, roasted cashews. The draw is still tight but I can't complain as each puff produces plenty of velvety smoke. The burn line shifts all over the place but so far it has not been an issue. The ash clung for about an inch and a half prior to dropping on its own. As it burns, the grey transitions to a chalky white gradually. For the cigar's bold start, the middle third is impossibly smooth and chill. The bread from the first third continues but is complimented with some nutty, woodiness. There is still a savory creaminess - reminiscent of gravy - that coats the palate with a very long and luxorious finish. The burn has really evened out nicely. The various peeks and valleys have worked themselves out to a great, razor sharp burn line - no big surprise from a Steve Saka produced cigar. The final third restores the pepper just a smidge. Each puff brings a good dose of pepper along with a toasted sesame seed cracker. The flavors are still very savory - there is an earthiness to it, similar to roasted mushrooms with some carmelized onions. It's not as overt as that but definitely reminds me of something that could be served alongside a great steak. There is a deep herbal earth quality to it. The draw was a little tight throughout the smoke. It never really merited the effort of pulling out my Perfect Draw tool but both of the Nacatamales I smoked for this review and the couple prior were almost clones of one another - snug but smokable. All the progress the burn had made in the middle third was lost in the final third. Finally I pulled out my lighter and carefully touched up some trouble spots that refused to correct themselves. The ash has been remarkably stout - typically hanging on to about an inch and a half prior to ashing. The Nacatamale lives in the subtle transitions of savory flavors. It began with a distinct black pepper start and seamlessly switched over to variations on a silky gravy-like flavor. Honestly, this cigar could be considered a chef's preparation of "Gravy Three Ways" - each third seems to punctuate the creamy, silk-laden gravy with a unique compliment. The first third - bread; second - wood; final - earth. It's really fantastic and definitely builds on the palate. This is unfortunately one of the downfalls of the Necatamale. The burn is not terrible but it does waver frequently and finally required a couple quick touch-ups. The cigar does burn at an excellent pace and I tended to smoke mine a little faster than most reviewers it seems. Saka mentions frequently that the Muestra line is a personal challenge to himself. In the case of the Nacatamale, he has a steep hill to climb with the cigars to follow. 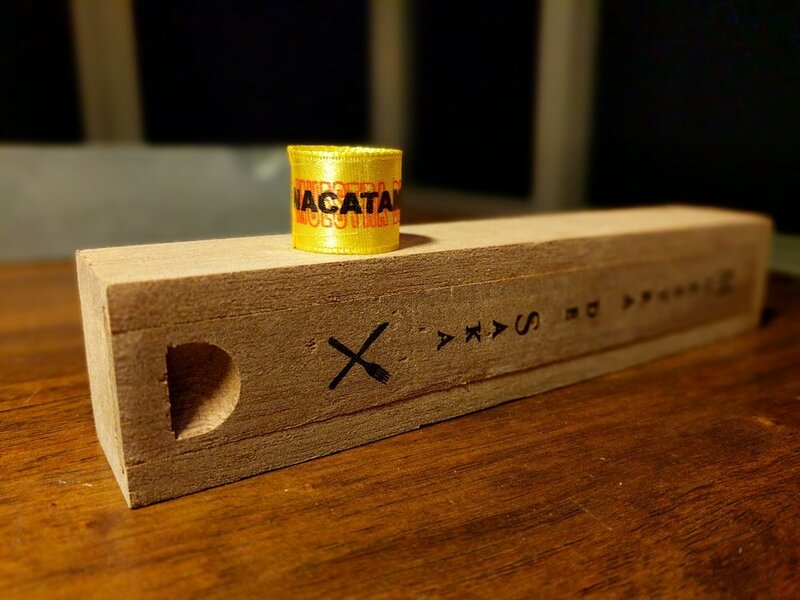 The Nacatamale is a robustly flavored, complex yet balanced cigar that is certainly a box worthy addition to any collector's stash. The flavors flawlessly build upon one another and leave the palate coated with an amazingly complex profile. The one knock on the stick is its burn experience. The cigar's price point and Saka's name on it demand a better burn line and probably an easier draw. It's not a huge flaw but worth noting that it really capped the highest I could rate the Nacatamale. All in all, I'm glad I've got plenty more to smoke through - the real trouble is going to be spacing them out because I have a feel that once they're gone, they're gone. Get ya some and don't look back! These puppies are sold out damn near everywhere! I found a couple sites that say they're still in stock - grab 'em fast! Of the reviewers who assign a rating, it averaged out to about a 9.4, which is really close to what I ended up giving the Nacatamale. Overall praise for Saka's latest is good - people generally seemed love this stogie. I'll be revisiting it regularly and certainly will update if needed - either good or bad.